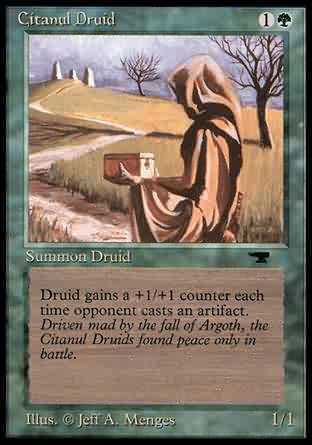 Druid gains a +1/+1 counter each time opponent casts an artifact. Whenever an opponent plays an artifact spell, put a +1/+1 counter on Citanul Druid. Driven mad by the fall of Argoth, the Citanul Druids found peace only in battle.